MAYBOLE has long, been a stronghold of Freemasonry and the two Lodges in the town are still viable although they have had many vicissitude throughout their history. Lodge St. John No. 11 is the older body being affiliated to Grand Lodge in 1737, the second Lodge, Royal Arch No. 198, being formed about seventy years later. In 1811 it was proposed that a third Lodge be formed in the town as at this time Maybole was a thriving burgh and it was thought at that time a third lodge would also flourish but Grand Lodge refused the application and, in light of the later downward trend in trade and population, this proved to be a wise decision. Masons' guilds, from which Freemasonry developed, were in existence hundreds of years ago and trade guilds of operative masons were spread all over Europe How these guilds of purely operative masons came to be associated with "free and speculative" masons and with religion is a long story, especially the connection with Saint John, and it is impossible to deal with the subject in a short article on the two Maybole Lodges, but a few notes on the development of masonry in Scotland may be helpful in showing how it developed in important centres and proves that at one time Maybole was a town of some standing. The earliest mention of masonry in Scotland is in 1147 when there was an existing Lodge of operative masons in Stirling, and its members were engaged at that time in building Cambuskenneth Abbey. There must have been many similar lodges throughout Scotland at that period when many abbeys were being built and it is almost certain there would be one in Maybole when Crossraguel Abbey was built. In 1729 the first Scottish Lodge of purely "Free" masons was founded in Edinburgh and named Edinburgh Kilwinning and all members were non-operative. The Capital of Carrick, not to be outdone by Scotland's capital also showed great interest in masonry about this time and although a definite date can not be confirmed there seems to have been a thriving lodge of free masons in the town in 1726, about three years prior to the founding of Edinburgh Kilwinning. The Maybole Lodge was originally called Lodge Kilwinning, but later the name was changed to Lodge Maybole and finally to Lodge Saint John. In 1736 the Grand Lodge of Scotland was formed in Edinburgh and Maybole was not long in applying for recognition and their charter was confirmed in 1737. The signatures to the confirmation of the charter were the Earl of Qurnartie, G.M., William Congalton, S.G.W., Charles Aiston and John Dougall, Secretary to the Grand Lodge. The witnesses were Archibald Govan of Greenock, J. Robertson of Hamilton, both members of Lodge Kilwinning, and Archibald Kennedy, an Edinburgh lawyer who was a member of Lodge Maybole. It is interesting to note the name of Archibald Kennedy as he would probably be a member of the Culzean family who have always shown great interest in Freemasonry and the Fourth Marquess of Ailsa, of Culzean, was one of the many prominent members of Freemasonry in Scotland. In 1737 when the Maybole Lodge was granted their charter the Right Worshipful Master was John Fletcher, a joiner in the town and his Depute was Archibald Kennedy, the Edinburgh lawyer previously mentioned, while the Senior and Junior Wardens were William Guthrie and James Maxwell, both local councilors and very important men in the town. 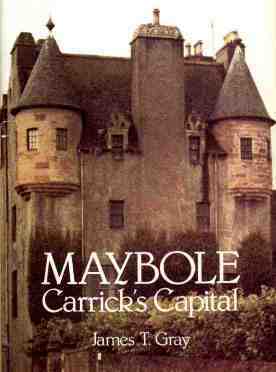 The first number granted to Maybole was No. 14 but this was changed to No. 10 at a later date and then finally to No. 11 which is its number today. It is a curious point that Lodge St. John No. 11 was one of the sponsors of Lodge Glasgow No. 4 and this is an example of an older lodge having a greater number than a lodge very much its junior in Masonic history and points to the confusion in numbering lodges throughout Scotland. In 1797 a second lodge was formed in the town, its sponsor being Lodge Royal Arch in Ayr and it was given the number 264 and named Lodge Royal Arch, probably in gratitude to its sponsor in Ayr. Its first R.W.M. was John Andrew whose Depute was John McLure and the Senior Warden was Robert Ramsay with another John McLure as Junior Warden. At a later date the number of this Lodge was changed to 197 and later to its present number of 198. It is interesting to note that at this period Culzean Castle was being built and it is probable many of the operative masons employed on the work, and who lodged in Maybole, would combine to form the new lodge. Lodge No. 198 has always had a greater number of operative members in its roll than No. 11 and even in recent years operative masons and builders have been more predominant in the younger lodge. It would appear there was little harmony, and definitely no brotherly love, between the two lodges in the town as before a year had passed a complaint was made to Grand Lodge in 1798 by two members of the older lodge, the Rev. William Wright and James Ferguson, that Lodge Royal Arch No. 264 was guilty of the "most heinous irregularities and carried out their ceremonies in a manner alien to the craft." No action was taken by Grand Lodge, however, and No. 264 blythely carried on for two years until 1800 when the R.W.M. of No. 11, Quintin McAdam, again lodged a similar objection to the workings of the junior lodge. The Grand Lodge then seems to have felt there was some justification for the complaint as they issued a stern warning to the Master of No. 264 who must have obeyed orders as there was no further complaint regarding the behaviour of the members or the method of carrying out their ceremonies. Masonic ritual was not standardised then as it is today and probably No. 264 members carried out their ceremonies in a different manner to those of No. 11, who being the older lodge, would feel that the young upstart lodge should fall into line and do as their elders and betters did. Freemasonry in Maybole has flourished since these days and both lodges are still strong with a good membership roll of fellows of the craft. During the nineteenth century, however, it can be truly said that masons took more part in the public life of the town than they do today. This was a century when trade and wealth increased in Scotland and many public buildings were built throughout the land and nearly all foundation stones for such buildings were laid with full masonic honours, when the members of the craft attended in full regalia with, invariably, bands to lead them. One of the first ceremonies fully detailed was the laying of the foundation stone of the new Parish Church in Cassillis Road, or New Yards as it was then named. On 4th April 1807, both local lodges marched to the site of the church with bands playing and ensured that the foundation stone was well and truly laid. Each lodge marched separately from their own meeting place and met at the site and after the ceremony again separated and marched back to their own lodges. St. Andrew's Lodge from Girvan marched with the members of St. John's Lodge, Maybole, while Ayr St. Paul's Lodge marched with Lodge Royal Arch No. 198. Both parties remained apart during the whole ceremony and it would seem the bitterness of seven years standing was still strong between the different lodges. On 19th March 1834, the laying of the foundation stone of Maybole Gas Works was a great highlight in the town's affairs and once again the two lodges were in the forefront of the proceedings although at the rear of the procession. A procession started from the Town Green and it is minuted that it. consisted of "the Friendly Societies, the Town Council, Shoemakers, Tailors and other Craftsmen in their robes of office, with insignia displayed, banners flying and music playing." A mounted horseman led off the procession, followed by the Weavers, who were then the most prominent craftsmen in the town, carrying the emblems of their trade . After them came eight members of the Maybole Carrick Band, the members of the Shoemakers Guild in full robes, then Wrights with their insignia., followed by the contractors responsible for the building of the new Gas Works. Next in the procession came the Magistrates and members of the Town Council and immediately behind them the remaining nine members of the seventeen strong local band. The rear of the procession consisted of the Masonic Lodges, in full regalia with banners flying, in the order of two Girvan Lodges, Ayr Lodge, Maybole Royal Lodge No. 198 and finally Maybole St. John's No. 11. It must have been a colourful sight to the local townspeople (with the Magistrates and Councillors without robes or insignia feeling rather out of it) and it is said the whole population turned out to view the proceedings and make merry afterwards. History does not record details of the masonic harmonies after the ceremony but it is interesting to note that the Secretary of No. 198 reported to the brethren at the next meeting after the harmony that only nine whisky glasses remained in the lodge from a stock which originally cost £5 l9s 1d after discount was taken off on payment of same. About the end of the nineteenth century the masons again met in full regalia to lay the foundation stone of a house built in New Yards across from the Bowling Green and this must be the only private house in the town where such a ceremony was held but it is believed the owner of the house was the then R.W.M. of No. 11 and this would be the reason for this unusual occurrence. In 1887 when the new Town Hall was built on the site of the old jail the members of both lodges in the town were again out in full strength to ensure that the operative masons laid the foundations to the satisfaction of their speculative brethren and no doubt the "founding pints" would be issued freely at the harmonies 'which always followed such outings. In 1905 the foundation stone of the Carnegie Library was laid with full masonic honours in the presence of the Magistrates and Town Council before a large gathering of townsfolk and this was the last occasion when such a ceremony was carried out in the town, but it may be that at some future date a building worthy of recognition will be erected in the old burgh when once again the craftsmen can take their rightful place and ensure the foundations are truly laid. Although Freemasonry flourished exceedingly well last century the two lodges were not without difficulties from time to time. In 1848 Lodge St. John was cashiered and not shown in the roll of Grand Lodge for that year, for the simple reason it had not paid its annual dues. The membership fees were 2s 6d yearly and lodges were granted two years to pay same to Grand Lodge, but any lodge in arrears for five years was struck off the Roll and therefore No. 11 must have been in arrears from 1843. It should be remembered that at this period trade was extremely bad and this decade became known as the "Hungry Forties" and no doubt the members simply could not afford their half crowns which was a considerable sum to them in those days. It was found that if £5 was paid this would put the lodge in good standing again and James Rennie called a meeting of the members who gathered up the necessary sum between them which was remitted to Grand Lodge and on 15th February, 1859, Lodge St. John was again admitted to the roll of Grand Lodge. On the following evening, 16th February, the resuscitated lodge met and elected, James Rennie as R.W.M. with William Hannay as his Depute. At this meeting William Hannay, John McMillan, James McMillan and John Kennedy, all members of Lodge Royal Arch No. 198 were affiliated to Lodge St. John No. 11 and it is interesting to note William Hannay was elected Depute Master, James McMillan, Senior Warden and John Kennedy was made Junior Warden. It would seem therefore that while the fortunes of No. 11 at this time had waned, No. 198 was in full strength and the old rivalries of 1798 had been forgotten or forgiven and the Junior Lodge members were willing to help their brothers in district. In recognition of this bond between the two lodges the members of No. 11 invited the members of No. 198 to dine with them on the evening of 28th April, 1859, and the invitation stated that No. 11 members wished to entertain their fellow brethren of No. 198 "with the greatest possible conviviality and to harmonise in the light." It would no doubt be a memorable evening but the memories of those attending seem to have been rather hazy as no reference is made in the Lodge Minute as to how the evening passed. Finance seems to have been a problem with No. 198 as well as No. 11 and the minute book of the younger lodge often refers to the difficulty in lifting payment of dues from its members in 1809. Grand Lodge proposed that a Temple be built in the town to house both lodges in the one building and offered financial help in the building of it. A joint meeting was held and on 25th August of that year both lodges sent letters to Grand Lodge regretfully turning down the proposal "due to the exhausted state of the funds in the lodges." In 1861 once again the two lodges considered the possibility of building a Temple for their joint use but after long consideration this project fell through due to "the exhausted state of funds." The "exhausted state of funds" is a phrase often found in the minute books of both lodges, and on 14th January, 1811, the treasurer of No. 11 reported there was only 1s 9d in the funds to carry on the working of the lodge. This is not too surprising when we read that in 1812 on the death of John McAdam, the treasurer of No. 11, his trustees refused to hand back his apron and jewel, which were lodge property, or to pay back £11 1s 6d of lodge funds which he had in his possession when he died. In the balance of accounts presented on 13th January, 1814, the lodge was in debt to the sum of £3 ls 2d, quite a considerable amount in those days when the cost of whisky and ale for a night's harmony among the brethren seldom exceeded five shillings in all. In early days the lodge members met in various places, mostly local hostelries, but finally for many years they settled on the Commercial Hotel (or Wyllies Hall at it was called) as the home for No. 11 and the Kings Arms Hotel for No. 198. When the Commercial Hotel Hall was put up for sale the members of No. 11 purchased it and formed an attractive Temple by closing up the access to the hotel and fitting it with masonic furnishings. In the 1940s further alterations were carried out and now it would seem to be the settled abode of the brethren. In the 1950s an old former inn in Castle Street, (known as "De Bunk" locally) was acquired by No. 198 and altered to form a compact and suitable place for the carrying out of their ceremonies. It is perhaps a pity the offer by Grand Lodge in 1809 to help in building one Temple for both lodges could not be accepted but perhaps the brethren in the town will yet combine to build a Temple with rooms for harmonies, etc., and this would be a splendid opportunity to bring back the colourful days when the members would "process with full regalia, banners flying, and music to lead them" to lay the foundation stone and thereafter join in an evening of harmony and conviviality. Should this ever happen it would be interesting to note if the treasurers would again have to report on the dearth of glasses remaining in stock as was recorded in 1834. During the nineteenth century both lodges flourished exceedingly well, even if in debt occasionally, and it was not until the first decade of the present century that a marked decline became apparent in their membership. In that period the Ladywell shoe factory, which had been a great source for new members failed and trade on a whole was in the doldrums and very few initiates joined the Craft. The first World War, however, brought much needed new blood into both lodges and many airmen stationed at Turnberry joined both No. 11 and No. 198 as well as many townsmen who were leaving to join the forces. During World War Two there were again a great number of airmen from the Turnberry R.A.F Station who joined the lodges and there must be many brethren spread throughout Britain who claim either No. 11 or No. 198 as their Mother Lodge. At the present time there is great enthusiasm being shown among the younger members of the lodges and in December, 1968, the members of No. 11 elected twenty-seven year old James Davis as R.W.M. and it is probable that he is the youngest master mason ever elected to this position in the whole history of this ancient lodge. No doubt the rise and fall in the fortunes of Maybole Freemasons will be repeated in the years to come but it is to be hoped that such an old established fraternity will continue to thrive in the ancient Capital of Carrick.